You'll love to make this triangle organizer, why? Because it's a fun-green-organizing craft! I'm sure you have a box or 2 of cardboard in your house, so what are you waiting for? go get them and make one! 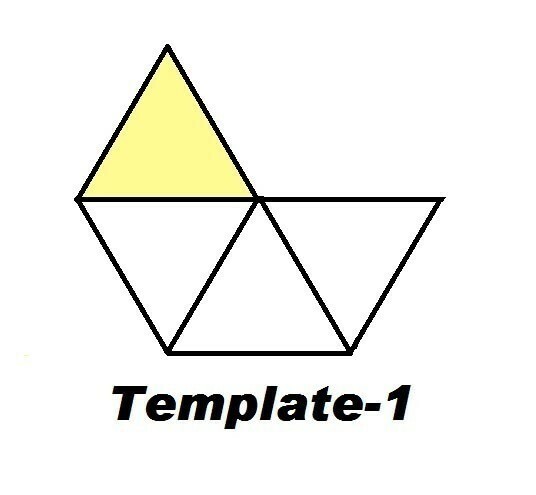 The template includes 4 triangles. 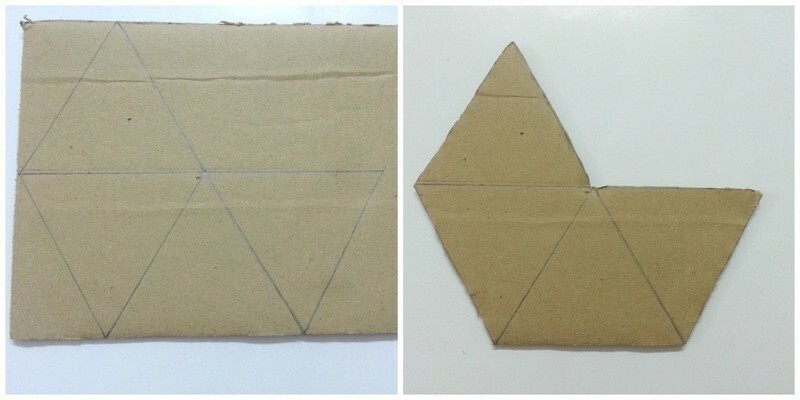 You can easily draw these templates using a ruler and pencil. Simply draw the templates on a piece of cardboard and cut around the edges of the pattern. Draw the template on a piece of cardboard using a pencil and a rule and cut it out of the cardboard. 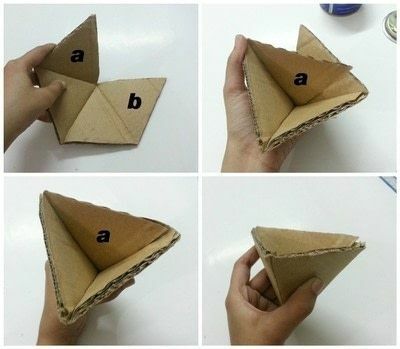 Fold the cardboard along the edges of the triangles. Notice that I've marked 2 triangles with the letters 'a' and 'b', simply glue the 'a' part (triangle) over the 'b' part (triangle). Now allow the glue to dry, meanwhile make 5 more of these triangular cardboard baskets. You can arrange them as you want but I wanted to arrange them in 3 rows (which turned out to look like an upside down pyramid). 3 baskets in the first row, 2 in the second and 1 in the last row. Color the baskets or-else they'll look dull and boring. 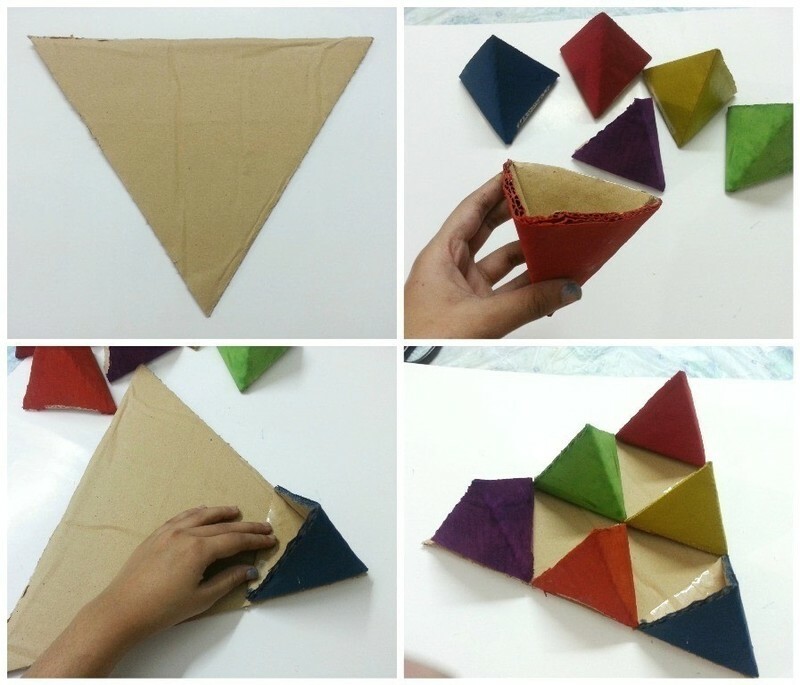 I had to cut a large triangle out of cardboard to glue all the baskets together, making sure that the open side of the basket faces upwards. 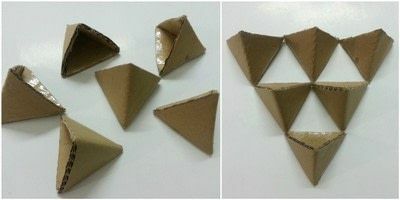 I glued the baskets on the large triangle cardboard piece and waited till the glue dried. Finally, attach a hanging mechanism with it. 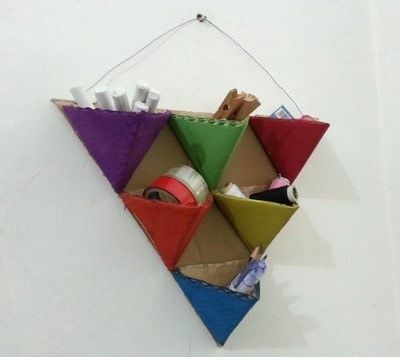 Hang it on a wall and keep your stuffs organized! 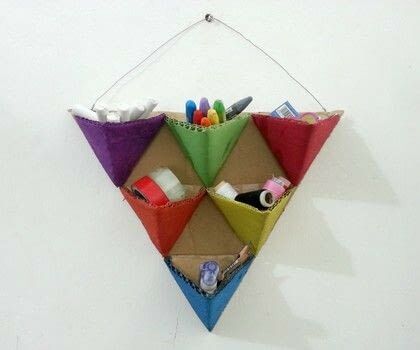 This would be perfect for craft storage!